As some of you probably know, last week was a little rough in our household. Poor Lulu got an ear infection which was followed quickly by hand and mouth disease. I think this is the only time I will ever have a doctor suggest that we feed our child ice cream because eating anything else hurts. Anyway, she was pretty much allowed to eat popsicles whenever she wanted. Now that she’s feeling better, we’re trying to limit them. This evening, she ate a good dinner, so I let her have a lime popsicle afterward. It was dripping, so I took it and put it in my mouth. Do you know what Lulu’s reaction was? “Spit mommy. Spit.” She wanted me to give her back the bit of popsicle that I had eaten. Needless to say, I didn’t, but it was still pretty darn cute. Have you ever thought about how many things we have to learn early in life? It’s amazing to think about all of the little skills that Lulu has already learned. Things like sitting back down after you stand up or putting lego blocks together required so much effort at first. Now she can do both of those things without thinking. The newest lesson I’m trying to teach Lulu is that the girl in the mirror is her. She loves looking at the mirror and showing herself how to do things. I feel like I’ve been neglecting telling you stories about the Gibster lately. That’s probably because he isn’t mobile yet. For the most part we’re still in the “eat, sleep, poop” phase of life. But one of my very favorite milestones happened last night. He giggled. Baby Gibby’s smiles take up his entire face. I think his laugh is probably what you would hear if happiness had a sound. It was wonderful. And then he slept from 11:45 until 5:45 in the morning. And it was even more wonderful. Baby giggles and a full night’s rest? Yes, please! I wish I had brought a tape recorder with us to dinner tonight. Out of nowhere, Lulu started saying the word happy. Other than mommy, dada and nana, this is really the only word that she pronounces really well. Ha – pee. Ha – pee. Ha – pee. Well, I did it. I went back to work this week. On Wednesday, I left my precious babies at daycare, drove to the office, and did my job. When Lulu was a baby, Hubby and I didn’t fully appreciate the swing that my parents gave us as a gift. I’d heard other mothers extol the virtues of this “baby must-have,” but Lulu didn’t really like it. She was happy enough to be in the swing, but she was just as happy to lay on her play mat or be held. 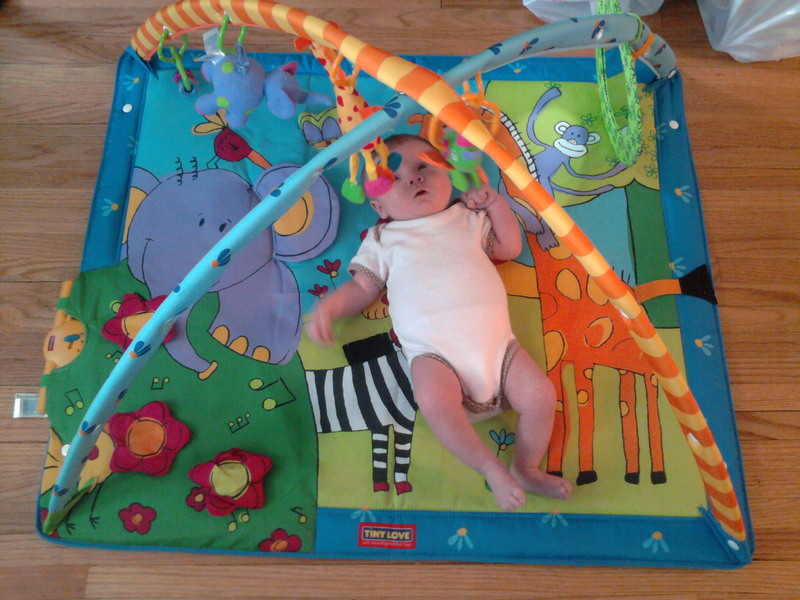 At one month old, Lulu was entranced the bright colors of the animals on her play mat. In fact, now that we’ve pulled it out again for her baby brother, she loves climbing in next to him to play with the hanging animals and turn on the music.